Anyone who starts to delve into the early history of this area soon reads about William J. Krome’s survey of a proposed route for the extension of the Florida East Coast Railway from Homestead to Key West via Cape Sable. Jerry Wilkinson has written an account of the expedition on his website, Keys Historeum. 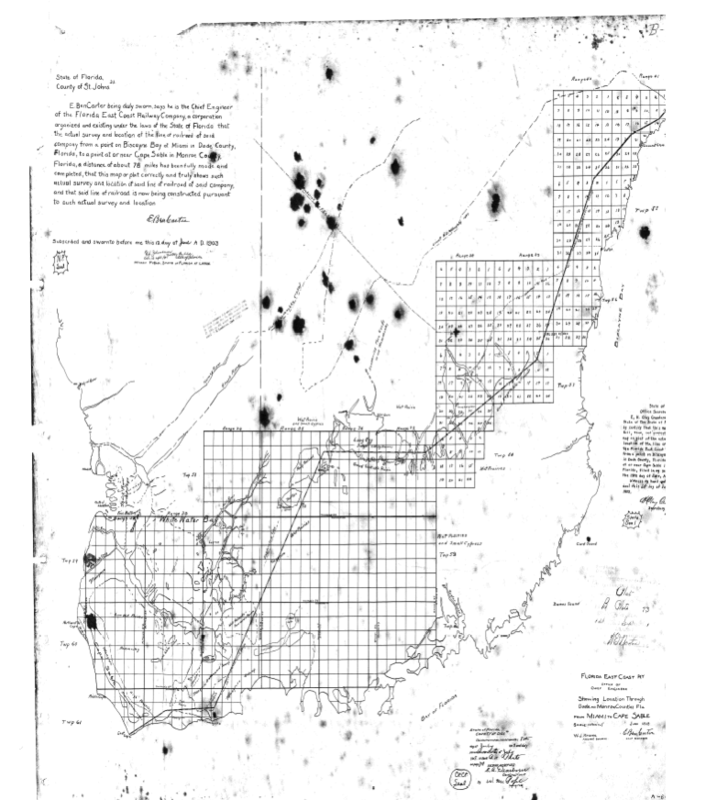 This survey was recorded in Dade County on July 8, 1903 and shows the location of Camp Longview, which, to the best of my knowledge, no one has ever seemed to know. The best that I ever heard was that it was located in Longview, west of Florida City, which wasn’t much help. This survey shows its approximate location: at the southeast corner of the intersection of Palm Drive (S.W. 344 St.) and Loveland Rd. (S.W. 217 Ave.). However, this may not be the final word on its location, as a letter from William J. Krome to E. Ben Carter, dated March 5, 1903, states that the location was in the NE 1/4 of 29-57-38 instead of in the NW 1/4 of 28-57-38. This letter is included in an essay about the Cape Sable Expedition by Jerry Wilkinson. While the exact location of Camp Longview will likely never be known, we have a much clearer idea of its location than we had before. Click on “William J. Krome’s 1903 Survey” to download a copy of the survey. Then, zoom in to see the symbol for the camp. It is located in section 28, township 57 south, range 38 east. If you wish to use David Torcise’s Google Earth map, the camp was located on the land subsequently homesteaded by Willis P. Ferguson. You must have Google Earth installed on your computer to view David’s map.